Clara was born January 1, or July 4, 1860 in Ann Arbor Michigan. Her father, Clement Thompson was mayor of Battle Creek. She led a fairly normal life, marrying and having two sons in Michigan. 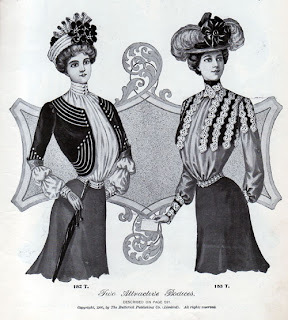 Then in 1898 she went a little crazy! She came to Skagway and then to the Yukon. Supposedly she married John Cameron in Dawson in 1898, he an RCMP. She left Yukon Sept 24, 1904 to go to Rexford Hotel, Boston MA. Her husband was J.A. Cameron as she was listed as Mrs. J.A. Although I’m still working on this case, she apparently ended up back in Skagway on July 21, 1908 where she died of a pelvic abcess. She was 48 years old. 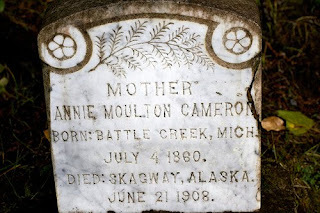 Her sons back in Michigan decided not to bring here back to Michigan but to bury her here in Skagway. Perhaps there was a little anger there for abandoning them when they were boys….. But who knows? And what happened to her Mountie Cameron? Her grave is in the Gold Rush Cemetery. 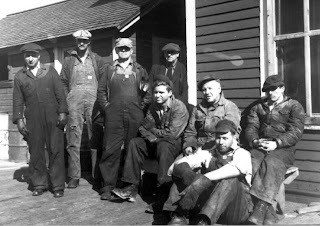 Here is a great pic of White Pass guys by the depot (?) taken by J.D. True. Let me know if anyone can identify these fellows! On December 26, 1947 Ed Logan, a White Pass machinist, died at Slippery Rock in a railroad accident. He was 35 years old and is buried in the Skagway Pioneer Cemetery. On this day, December 25, 1899 one of the most famous triple homicides in Yukon history occurred. Although it happened in the Yukon, it involved a young man,26 years old, Frederick Clayson who came to Skagway with his widowed mother and brothers and sisters. They started a general store here which continued until at least 1915. One sister, Ester was married to Dr. Pohl of Skagway. The murder occurred at Minto and was done by perhaps two men who laid in wait for travelers. George O’Brien shot and beat to death Clayson, Olsen and Lynne Relf. His crimes went undiscovered for some weeks despite the Clayson family pushing the NWMP to investigate. One especially brilliant Mountie did a crime scene search once the bodies were discovered. The bodies had been pushed into the river but floated downstream. The NWMP interviewed many people and eventually discovered the murderer who had stolen a dog that belonged to one of the men they killed. The dog was a large yellow dog which the Mounties then used to lead them to the scene of the crime. 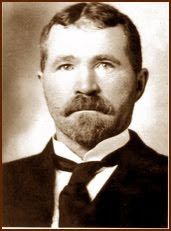 This investigation led to George O’Brien’s subsequent execution in Dawson and became the source of the saying “They always get their man” when referring to the Mounties. The second murderer was never caught, but it was thought he died soon after anyway. Fred Clayson had been returning from Dawson on a bicycle – an astonishing feat in itself! His family later moved to Oregon and one of his sisters became a famous physician there. The picture above is of Fred’s mother, Annie Quinton Clayson and is from the OHSU website from the Ester Pohl Lovejoy collection. Scipio G. Ratto was born in San Francisco, April 14, 1869, the only son of Mary Cuneo and pioneer Bartholomew Ratto who migrated to the United States from Italy in 1849. Bartholomew Ratto settled in California in 1852, arriving in San Francisco on S.S. GOLDEN GATE after traveling across Isthmus of Panama via muleback. He had a general store in Mother Lode country, Calaveras County. Later he owned and managed two bakeries in San Francisco, one located in the downtown area on Post-Street (present site of Olympic Club), another on Dupont Street (now Grant Ave.) Subsequently they lived with son, Scipio, in the historical old Montgomery Block in San Francisco and managed the building in late 1890s. As a boy and young man, Scipio Ratto came to Sausalito on family picnics and club gatherings (south end of Sausalito). He grew to love the town, its quiet atmosphere, its scenery, and the blue waters of San Francisco Bay. Scipio Ratto journeyed to Alaska and Yukon Territory with his cousin Ernest Ratto, during the gold rush of 1897. They left San Francisco on S.S. UMATILLA on Sunday, July 25, 1897. While in Alaska and the Yukon, they prospected for gold. The receipt above would seem to indicate that “B. Ratto”, his father Bartholomew, bought a few things in San Francisco for Scipio. Scipio was later a clerk in Dawson, working in stores of J. Timmins and George Bieber in Dawson. By the 1920’s he was back living in Sausilito, California. He had step-brothers Gervasio, Giovanni and John in San Francisco where he died on this day, December 22, in 1951, he was 82. There was a branch of the Red Front Clothiers in Skagway which is now owned by the National Park Service and leased to businesses. The park is now renovating it to rent to another jeweler next summer. His daughters donated his papers to the Alaska Library and wrote the biographical information above. Jack Dalton had a very long and very interesting life. He was described by a woman in Haines as “a dapper, well-dressed, ladies man”. He is best known for opening up the “Dalton Trail” out of Haines. He ran a hotel in Haines in 1896 and later arrested Jack Wade for murder, but also was himself jailed for shooting a shopkeeper McGinnis. He was later acquitted. He was mentioned in the 1903 AK Boundary Tribunal by Don-a-wak, chief of the Chilkat Indians. In 1886, Jack signed on as roustabout and camp cook with the Schwatka-New York Times expedition to climb Mt. St. Elias. The party began their ascent at tidewater in Icy Bay on July 17, 1886. They traversed rugged terrain for twenty-five to thirty days, crossed fast coastal rivers, and reached an elevation of about 5,700-feet before Schwatka’s health failed, which terminated the first recorded attempt on the difficult mountain. Dalton is featured in the Alaska Mining Hall of Fame Foundation website. Born in 1856 in Michigan, he died in San Francisco on December 15, 1944. Daniel Lopez was born in San Luis Obispo in 1870 or 1871. His father Leonardo came to California from Mexico to farm and married Raphaela. 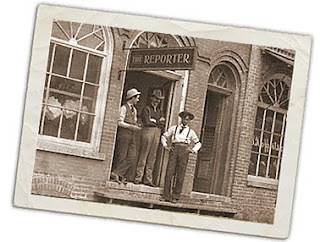 Daniel was a barber and a reporter who was sent to the Klondike to report on all the activity here. Unfortunately he only made it as far as the Chilkoot Pass because on December 13, 1898 he died there of exposure. The winter of 1898-1899 was the most severe winter for decades. 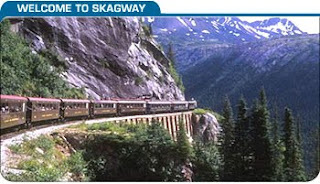 Today in Skagway it is a balmy 27 degrees F. with no wind and a light dusting of snow. On this day, December 10 1943, three women died according to the Skagway Death Records, but no indication of why they died. There is also no record of where Signa Rugene Sletten, Mary Andrews Steinard, and Margaret Alma Stukel were buried. During this time there were fires that took down the Elks Hall, Pullen House and the Mission School, so perhaps that is a clue….go to work fellow sleuths! P.S. 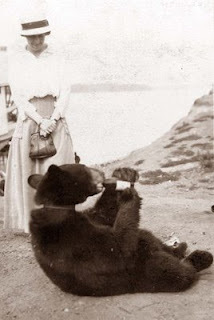 the photo above has nothing to do with the Mystery, except that I wonder what type of beer this bear is drinking. “Arizona Charlie” had a dance hall in Dyea in the goldrush. He also had a saloon at Stone House and then a Grand Opera House in Dawson. He was born in Visalia California in 1860. Charlie was tall, dashing, and flamboyant. 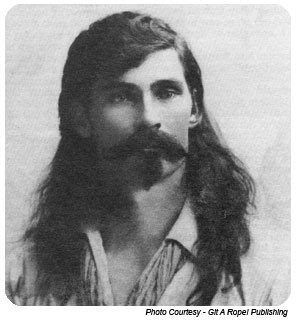 He wore a flowing moustache and long hair, in the manner of the Wild West showman he was. He had a dozen careers and a thousand schemes. Occasionally, one paid off. He prospered during the Klondike gold rush. Charlie’s Grand Opera House, now called the Palace Grand Theater, is a landmark in downtown Dawson City. He was a legendary sharpshooter in Buffalo Bill’s Wild West Show. He apparently bled to death on this date, December 9, 1932 in Yuma Arizona while operating on his own vericose veins w/pocket knife. 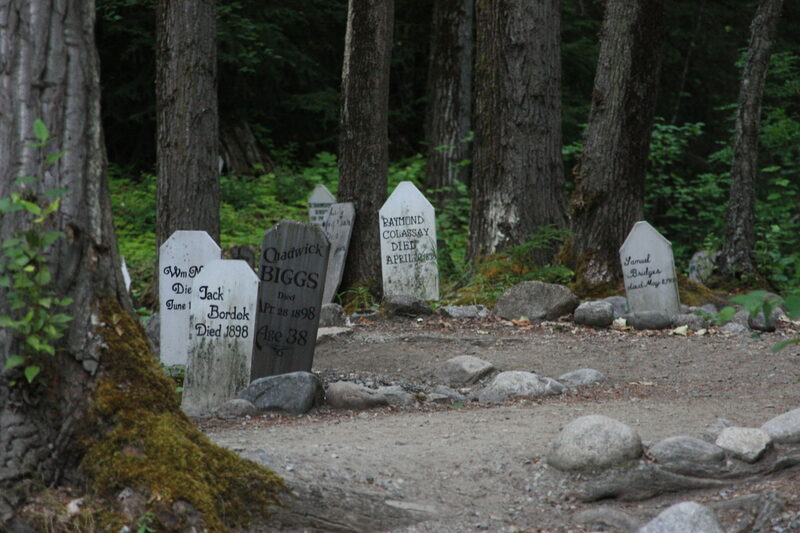 I first became interested in compiling the history of individuals in Skagway when I visited George Mowl’s grave in the Elk’s part of the Pioneer Cemetery (difficult to find without directions). His gravestone and the two stones on each side of him were vandalized years ago, so it was difficult to read them and so I decided to do some research. Turns out, he came here from Ouray Colorado in the goldrush. He was a tailor born in England in 1840. He started a men’s clothing and tailors at 461 Broadway in Skagway with Mr. Ehrlich. He later started the first moving picture theatre here in 1915. His wife Annie was a ladies tailor and she died in 1911. George then married another English lady, Mary Ann who came to America in 1918. George lived in Skagway over 20 years, and died on December 5, 1919 and was buried next to Annie. Mary Ann died in 1920 and was buried on his other side. He never had any children.